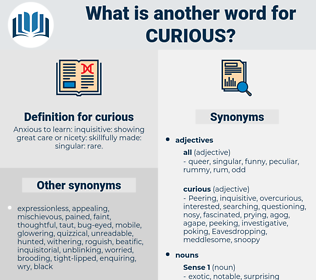 What is another word for curious? Anxious to learn: inquisitive: showing great care or nicety: skillfully made: singular: rare. bizarre, inquisitive, remarkable, nosy, outlandish. interested, puzzling, nosey, anxious, ironic, singular, awkward, amusing, astonishing, extraneous, uncanny, eager, keen, surprised, mysterious, striking, suspicious, unfamiliar, noticeable. fascinating, exciting, surprising, extraordinary, intriguing, Intrigued, strange, concerned. normal, ordinary, uninterested, average, usual, indifferent, disinterested, unconcerned. commonplace, standard, regular, common, Familiar. 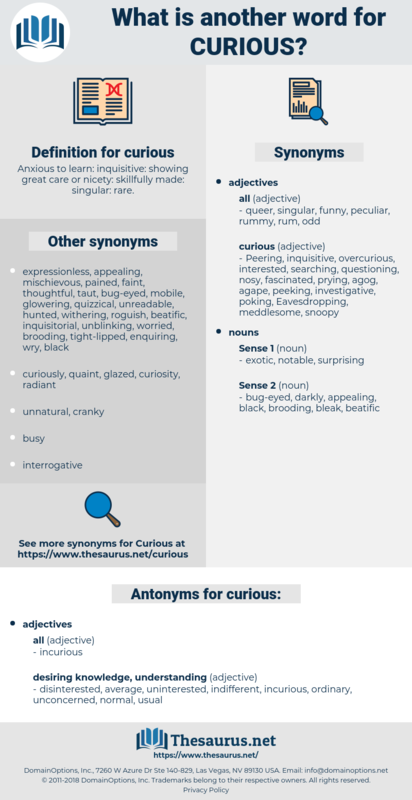 customary, garden, frequent, uncurious, expected, wonted, inattentive, routine, typical, predictable, plain, habitual, conformist, heedless, apathetic, careless, conservative, conventional. Also, one thing was curious. It was very curious, he thought, that he should have forgotten his brother. cargo, cereus, crius, carex, Cashier's Cheque, cyrus, caress, carriageway, cerous, crax, carcase, Cyrus Ii, church key, caricaceae, corse, crease, courage, charge, corkage, crosswise, cross-check, crazy house, carouse, curacoa, crocus, coarse, church, ceraceous, carrack, corgi, carica, carassius, carcass, crick, crossways, curry sauce, coryza, circe, cirrhosis, casework, cross-eye, choragic, carriage, cork oak, cirque, crecy, chorus, crock, cherokee, cockroach, curacy, cark, carjack, choric, crake, circaea, crush, coracias, crux, ceric, carissa, carack, crookes, corsage, curse, coriaceous, crex, cow shark, craze, carioca, cracow, creek, cruise, casuarius, crisis, cirrhus, creese, cross, crag, curacao, craigie, crosscheck, cirrus, creak, cherish, crass, caruso, crook, Ceruse, checkers, crazy, cerise, CCRC, caracas, coerce, course, creaky, couch grass, cruse, croak, car race, curiosa, crossway, crouch, crack, creche, croesus, crossjack, crus, carious, corsica, carcajou, characeae, crash, cercis, crosse, corky, corixa, Cheshire Cheese, cork, chirico, coach horse, choragus, ceres, courageous, cuirass, cashier's check, carsick, chorizo, cockhorse, circus, ceras, curassow, creashak, chirk, craggy, croaky, cress, corokia, Caroche, corozo, currish, crouse, carriage house, caries, carrizo, correggio.